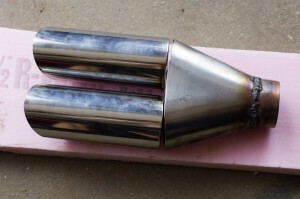 A friend came to me asking about building a custom exhaust for his Ferrari 308. Of course I said we could do it and that it’d be a fun project. I put together a rough price list/cost estimate for him and he decided to go ahead with the project. We were not reinventing the wheel here but instead just copying one of the commercially available units with some minor changes like original style dual exhaust tips and keeping it 100% stainless steel throughout. Before we got started we took careful measurements of the exhaust tubing size and did some tracing of the exhaust mounting flanges. 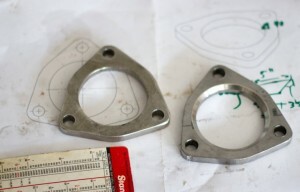 We did look extensively online to buy the flanges but nothing was available in mild steel, forget about in stainless steel. Being a Ferrari they are of course very much not a standard part. I drew them up in CAD, generated the G-Code for my CNC milling machine and banged them out. I say that like it was trivial but the piece of stainless steel stock was nasty. It had some internal work hardened spots from shearing which ate up a few carbide end mills. I then fabbed up some exhaust tips, polishing the tubing on my metal lathe prior to welding them up. I hammer formed the 2 to 1 sections and they came out reasonably well. I did use a tubing expansion die at the end to form the perfectly circular opening for the tubing by stretching it out the last little bit. 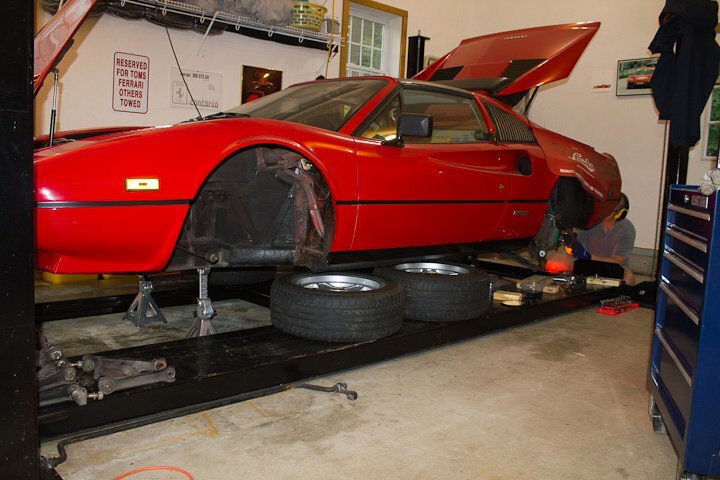 The Ferrari 308 in question was also undergoing a complete suspension overhaul at the same time. You can see my buddy in the back doing some cutting. I’m beveling the tubing edges prior to tack welding. I find that beveling the edges of tubing results in a much cleaner final weld that can be metal finished easier. My buddy claims he will metal finish all of the welds and polish this thing up someday. 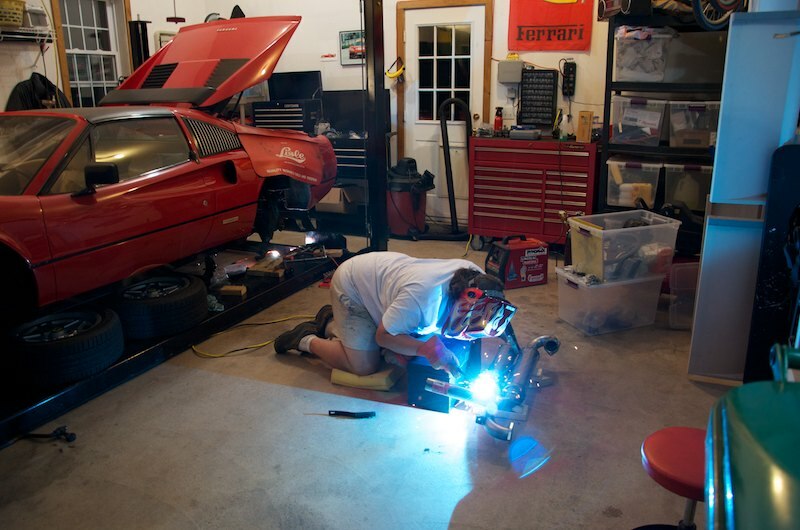 The pic on the right is me welding up the exhaust bits we are satisfied with off the car. Only after checking multiple times that everything is in the correct spot and fits well did I do any final welding. There are spots on the exhaust I wouldn’t be able to weld up fully if I waited till the entire unit was tack welded together so we built it in stages. With any sort of custom exhaust fabrication process, it’s important to tack weld and check everything often and repeatedly. I bet we took the exhaust on and off the car over 50 times during this build. Carefully measuring, checking level, angles, and fitment each time we made a change. Here you see one side all tack welded in place during the build process. When the car is back down on the ground I’ll take a video clip of it running and taking off so you can all hear the glorious sounds this thing makes. 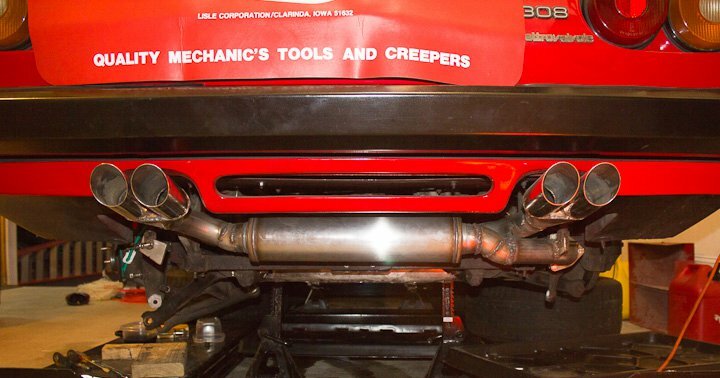 Ferrari engines have a beautiful sound and this exhaust brings out the best of that. 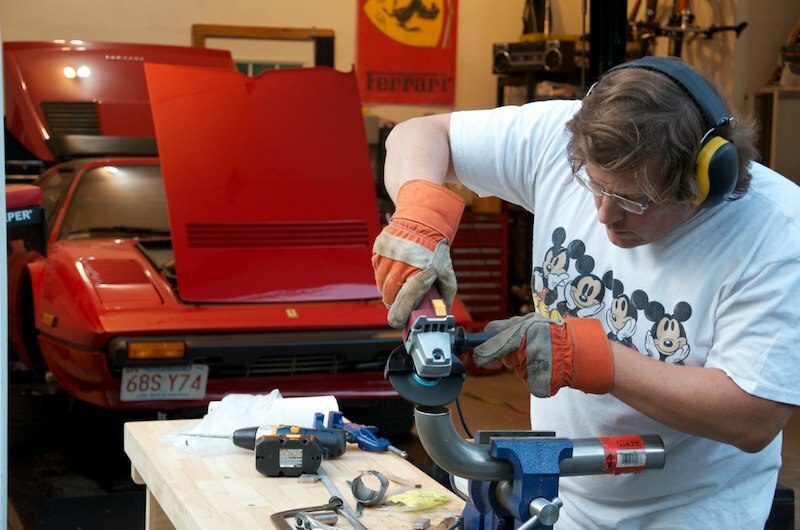 This project is continued and completed in this second post titled, finishing up a Ferrari 308 custom stainless steel exhaust. Zac do you know where those 3 bolt 2 inch flanges can be purchased? 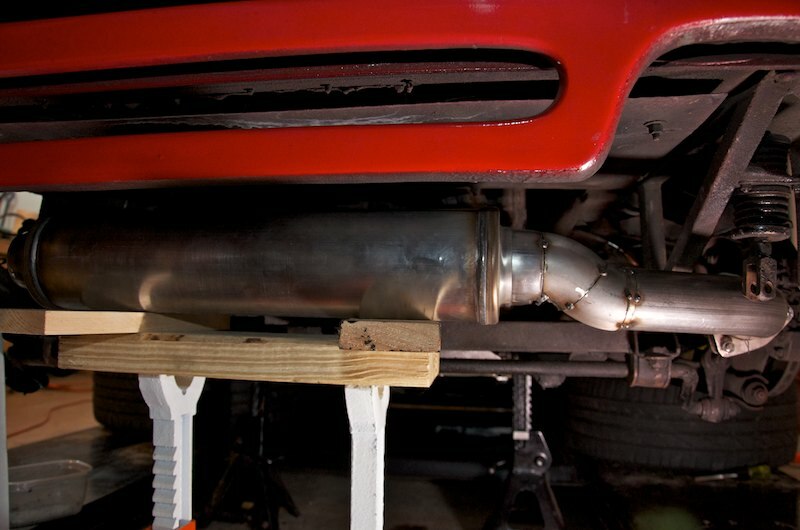 I’m doing some custom exhaust work on my Ferrari. Nope, I had to make them on a CNC Machine. They were a very odd patter, likely hand made back in the day as they were a bit off from symetrical.